I once did a painting of a doorway in a barren landscape with a naked man crawling through it. It still hangs in my studio and reminds me that there are times in our lives when all that we know feels stripped away, and we find ourselves stranded on a threshold between the past and the future. That painting was part of a show I did shortly after we moved to Rehoboth full time in 1990. That time period is remembered by us today primarily for the founding of CAMP Rehoboth, but behind the scenes Steve and I were both experiencing life-changing passages—the devastating loss of friends from AIDS, deep spiritual growth, and the natural shift in focus that comes as we mature. This new year is somewhat akin to that time period for me, though I do not feel naked nor lost in a “barren landscape.” I do feel as though I am standing on the threshold between the past and the present. The good news for me is that I do not feel trapped in the past, and I find hope in the creative potential that seems to be the most productive way for me to deal with grief, loss, and change. This was my first Christmas without Steve. I expected it to be emotional, and it was. Family gathered, we laughed, cried, and remembered Steve. Yet as family returned to their various homes, and the cold and grey of winter set in for real, my spirits sank. Grief sat on my shoulders, heavy, solid, and soul deadening. In the first week of the new year a friend met with me to take care of some CAMP Rehoboth business—which we dispatched with quickly. Her husband, also a friend, had passed away from cancer a few months before Steve. We sat there in my office and talked for two hours, and sometime during that conversation, she shared with me some words from Norman Lear. “That’s how I’ve gotten through it,” she said, tearing up. Those words struck me like a slap in the face. I teared up too, thinking about them in the context of my life with Steve and with CAMP Rehoboth. Yet that night for the first time, I felt better. A window had opened in the grey flatness of loss. I glimpsed hope—and that is all it takes to keep hope alive. “I live in that moment,” Lear said. Somehow, so do I. Because it means that there is a future, and there is something next! Throughout the desperate last months that we fought Steve’s lymphoma, and in the months of grief, heartache, and change that followed, I was held upright by love—love for Steve, love from Steve, the love of dear friends and family, God’s love for us both, and the unending outpouring of love, support, and understanding from the larger community around us. The theme of this issue of Letters from CAMP Rehoboth is love. It is our Valentine’s Day issue. I cannot think of a better way to start a new year than remembering the way that love changes our lives and moves us from one place to the next. There is no better way to anchor ourselves in the present than to celebrate the way love works in our lives. Even if we live alone, as I am doing for the first time in 40 years, love is present. Love is present in the way we behave around other people. Love is present in our memories. Love is present in the way we share with other people. Nothing makes us feel better about what is happening in our own lives than taking the time to love others enough to offer a helping hand, a word of encouragement, or to listen to what is happening in their lives. In the months after Steve died, I printed a notecard. 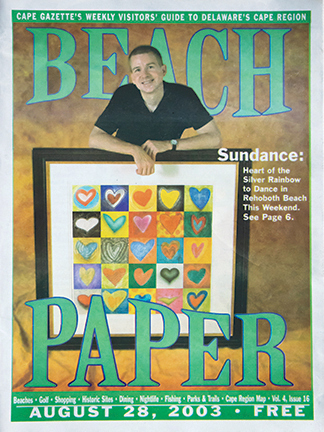 The image on the front of the card is a print of my 2003 Sundance painting titled Heartbeats. 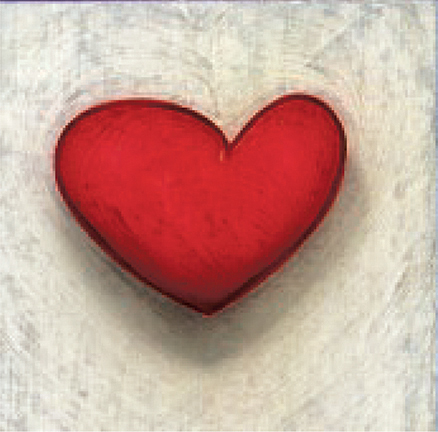 The 25 hearts in that painting celebrated our 25th anniversary—and I had Steve draw one of those hearts into the underpainting. On the back of the card is a photograph of Steve’s heart and an explanation of his death from lymphoma just shy of our 40th anniversary. In recent years, our technology has exposed the ugly vein of hate and fear that ripples under the surface of our society. Racism still shapes our country and our world in ways we previously thought to be ancient history. Fear of cultural change is driving an anti-immigration bus right over the truth that we are a country of immigrants. Our transgender brothers and sisters are facing loss of jobs in the military. Young LGBTQ people are bullied online and in school. Politics divide our nation as deeply as it did during the civil war. Fortunately, our technology also allows us to share stories about the good people in our lives—about the love in our lives. In truth, the only weapon we have to use against hate and fear is love. Love celebrates the courage it takes to stand up to injustice and abuse. Love honors truth. Love forgives. Love creates conversations and not confrontations. Love is kind. Love welcomes all. Most of all love has the power to heal a broken spirit—and a broken world. One heartbeat at a time!